Carole's Chatter: Food on Friday - Where's the Beef? Food on Friday - Where's the Beef? It’s Friday again. This week the ingredient for Food on Friday is Beef – all kinds of beef – mince (ground), steak, pot roast, stews, stir fry’s – you name it – if it’s about beef – please put your link in. 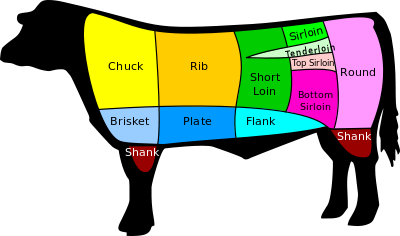 I found this chart in Wikipedia showing American beef cuts. 2 Put the link to the particular post into the second box – don’t just link to your home page. To do this, click on the title of your post and then copy the url that pops up at the top of your browser window. I know that the Mr Linky widget encourages you to comment. And if you want to, that’s great. But don’t feel under any obligation to put in a comment. Your link will still work and I will visit it. I have now put up a sidebar on the right of the blog which lists the ingredients that have been the subject of Food on Friday so far. You can just click on any that you are interested in – and you can still put links in on those earlier posts. What a sweet surprise to find your comment asking if I wanted to add my recipe to your link! I've added it and will also add your blog to my sidebar so I can come back and visit again! Thank you!! Thanks for stopping by and suggesting the link up! Hi again, can you delete #11. I hit back and I got published as #11 & 12. Sorry about that! Thanks for including and contacting me. Nice blog. Posted an easy traditional comfort recipe. Yankee Pot Roast. What are you referring to by "Word Verification Stuff?, Carole? The Capta Spam prevention box? I keep that active, because of the spam comment people and messages that are mass spam. .... When are you going to do a Spam Friday Food Theme? ha! Thanks for asking me to link up on your blog! Saw a couple great meal ideas, bookmarked them for later. Thanks for leading me to this your site. Next time I'll read the directions and post the recipe name along with mine! I am one of those people who has to have red meat in my diet (for health reasons, yes). Plus, I just love it. Thanks for asking me to post. And that was supposed to be SIRLOIN... WHOOPS. thanks for inviting me. This recipe is a guest post, but it's wonderful! Thank you so much for inviting me to link up! I wasn't sure if I was supposed to add my blog URL or the recipe URL. Hope it posted okay! Enjoyed your blog. Thanks for the invitation and am honored to share my Salted Steak Recipe. YUM! Can't wait to try these other delicious dishes! Love all the beef recipes this week! Thanks for inviting me. Great idea. Thanks for the invite too! It is always a plessure to share! Thanks for the invite, I hope I figured out the linking part! Thanks for the invite Carole! I think I linked wrong the first time, sorry! Thanks for the invite. Sorry if I screwed up the name thing...it's a bit unclear that the recipe name is supposed to be added, not the website name. Thank you for the invite and sorry I hit enter before typing in the name of my recipe for Mediterranean Stuffed Flank Steak! Carole, thanks so much for inviting me for the link-up! Really good idea, thanks for the comment on my blog. I like your blog and am following. Thanks for the invite and for stopping by www.simplyvicky.com! Just added my recipe, Slow Cooker Braised Asian Short Ribs - hope you enjoy! Thanks for the invite! Lots of great ideas here! Thanks for visiting and I'm sorry for being so tardy! Carole - I just flunked my Slow Cooker Braised Silverside of Beef link. Hopefully the right one will be there in the end, but if not, perhaps you could iron out the wrinkles for me! Couldn't resist - had to post up a link for my Rich Beef Cottage Pie, it was so good! Thank you for sharing your delicious food with the world. Braised Beef is a personal favorite. Pizza is addictive. Grilled Pizza has become my newest obsession.